Crazy Trip™ 2010: Post 6: Day 1 (Really) – Words, Words, Words. The sleeping compartment is not exactly what I envisioned from the photos on Amtrak’s website. It’s…um…well, it’s small. If I were to share it with someone, I would have to enjoy that person’s company very, very much–and be willing to risk not enjoying that person’d company by journey’s end. 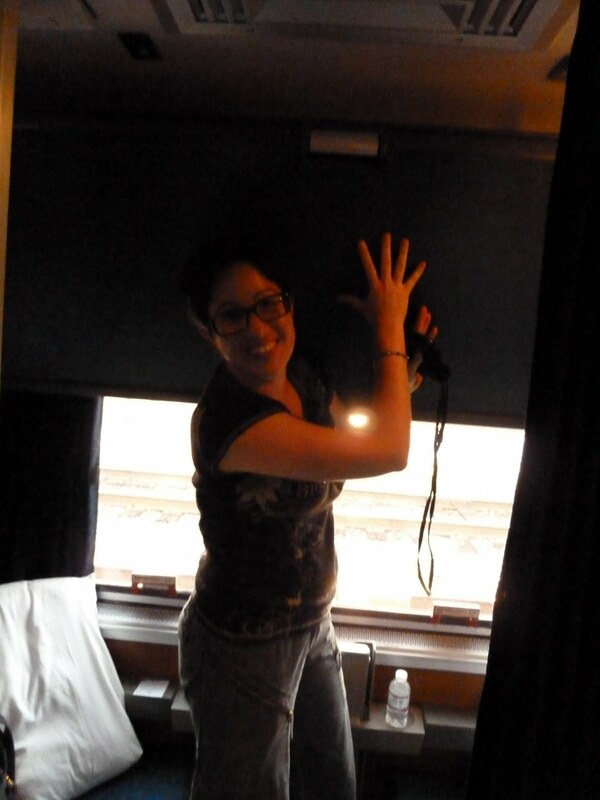 As I type, the upper berth looms a few inches above my head (I am slouching). I will be attempting to sleep up there, being well trained in the art of narrow-mattress maneuvers, because my carry-on suitcase needs a place to spend the night. I wonder if there is any air in here. There’s a gizmo on the wall which bears the markings “cooler—normal—warmer” (or something like; the shadow of the upper bed makes it impossible to read). There is also a soft whooshing noise which seems unrelated to the rumble-whoosh-pocka-pocka of the train itself. So I believe some sort of air like substance is flowing. Maybe it just isn’t getting past the overhead mattress. I will lean out…ok. A bit better. There is a “closet,” or so it calls itself. If I had a raincoat, it might fit in there. There are two seats—my carry-on is on one of them, my backpack and computer bag beneath. Really, can I not open a window? I would very much like a bit more oxygen, please. The bathrooms and single shower unit are just a few steps away, and I very much enjoyed the challenge of washing my face in something the size of an airplane’s toilet sink set half-beneath the mirror. Getting the toothpaste foam spit into the area which had a hope of draining was a nice trick, too. Thankfully, the paper towels were in good supply, so I could make a pass at drying the floor I’d liberally splashed with water. Window. Open. Air. Please. Do I have to do something to the fan unit on the ceiling? No, more’s the pity. But, on the bright side, being on the upper bunk will get me that much closer to the soft brush of air coming through the vent. I’m afraid that when I tell people I’m helping out my elderly parents while writing and doing freelance animation, they picture me changing bedpans and hauling around wheelchairs. They get a very serious look and nod solemnly while making low “ohhh,” noises despite my waving my hands around and saying “really, I only drive them around to appointments and stores.” It doesn’t matter. I am a noble, brave adventurer. Stuck in a very small compartment with limited air.